But during our road trip around North Island of New Zealand, we got messages from a handful of people who told us we just had to make time for Wellington, the country’s capital city. Fun fact: Wellington is the southernmost capital city in the world. Cool, huh?! Oh, and it’s also known to be the windiest city on earth (though we didn’t experience much wind while we were there. “Most underrated capital city in the world!” is how one Kiwi described it. 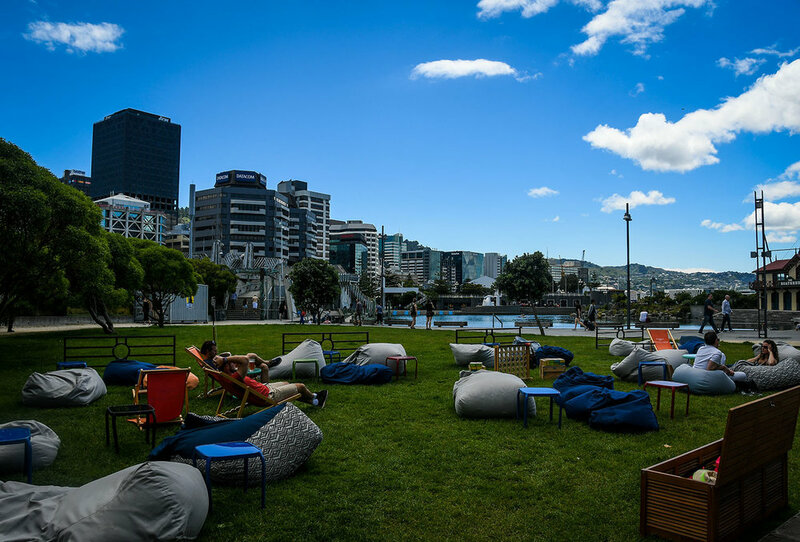 While we haven’t visited enough capital cities around the world to vouch for that statement, we can say with certainty that Wellington is a super cool “Little-Big City” with tons of fun and cheap things to do. We had just one day in Wellington, and there are so many things to do that we damn near packed every minute full of exploration! Below are some of the best inexpensive things to do in Wellington, whether you have just one day or a few. And the best part is, they won’t ruin your travel budget – many of them are actually free! Well actually, a very sweet reader pointed us in the direction of food. After calling Wellington home for 10 months, she had quite the list of recommendations for us, with a focus on the best places to eat (she speaks our language!). The Preservatorium Cafe was on her list, and she described it as “THE cutest little cafe that no one knows about”, and it didn’t disappoint! This is a great place to try a proper Kiwi style breakfast (beans, toast and eggs) and get a strong cup of coffee before a day of exploring. And the quirky vintage décor and reasonable prices don’t hurt either. With commanding views of the wharf and the city below, Mount Victoria makes a great stop while in Wellington. For a bit of a workout, you can walk up to this viewpoint or if you have limited time you can simply drive to the car park. Either way, you’ll be treated to panoramic views of the bay and the sea that lies between New Zealand and Antarctica! And on a clear day, you can even see the South Island in the distance. This pedestrian street is popular with locals and visitors alike. With a variety of trendy shops, fun restaurants and quirky bars, you’ll no doubt find a few places to pop into. We are (huge) fans of IPAs (and porters, and stouts…. ), and we were underwhelmed by the selection of craft brews around New Zealand. The only exception to this was in Wellington, where there are actually quite a few taprooms and breweries to choose from. If you too are a craft beer lover, you will find your bliss in Wellington! Heyday Brewing Co.: This is the brewery we went to for one beer, which turned into two! They had a great selection of IPAs (and other craft brews), and we just couldn’t leave without trying more. We got an order of fries (aka “chips”) with sour cream and sweet chili (a popular Kiwi combo), and it was fan-freakin’-tastic. More Breweries in Wellington: Garage Project, Parrot Dog and Black Dog Brewing all came recommended to us as well! This free (yes, FREE!) museum is smack dab in the center of the downtown wharf area, and is well worth a stop when you’re in Wellington. This museum is most well-known for a colossal squid, which was not on display during our visit. And while we were there, they were setting up for a Terra Cotta Warrior exhibit, which was also not open. But even so, there were a ton of other cool things to see – replicas of traditional Maori houses, modern and historic art pieces, and a super interesting exhibit on the World War I. There’s even a little “native bush walk” just outside the museum, where you can get some great city views. You could easily spend an entire day here, but if you have limited time you can pop in for a quick look at the highlights (like we did). I mean, it’s free, so why not?! Another free activity that you should definitely take advantage of in Wellington is exploring the Botanical Gardens. This massive park has masterfully-pruned gardens and greenhouses as well as winding dirt paths into native bush where there’s a good chance you’ll find solitude. Tip: You can take the iconic Wellington Cable Car to the botanical gardens for a fun ride! Bonus: Every Sunday morning from 7:30am - 2pm, you’ll find a harbor-side farmers market next to the Te Papa museum where vendors sell local produce and artisan goods. If you happen to be in Wellington on a Tuesday, Wednesday or Thursday, and like to test your trivia knowledge, go to one of the weekly Quiz Nights! Interested? Here’s more information on Quiz Nights in Wellington (and a few other cities). Kiwis and Aussies have a debate when it comes to the Flat White. Both claim to be the origin of this trendy coffee drink. And truthfully, we may never know who actually had it first. But while you’re in Wellington, there’s no harm in ordering one, as this city is where a Kiwi barista claims he accidentally invented this stronger take on a latte. Honestly, the drink isn’t all that unique (it’s just espresso and steamed milk, after all! ), but it’s still fun ordering something in the place of its origin (or supposed origin, in this case). And Kiwis sure do take pride in their coffee-making abilities. So get your caffeine fix with steamed milk (and no foam). If you’re feelin’ fine and in the mood for a fancy cocktail, Night Flower is sure to impress. This speakeasy bar is a bit tucked away, but that’s part of the fun. You’ll feel like you’ve stumbled upon a local secret once you enter this beautifully-designed space! The bartenders are wizards who can whip up cocktails based on the flavors you like. Many ingredients are made in-house, and while the drinks are not exactly cheap, the prices are what you’d expect for thoughtfully prepared concoctions and an intimate, speakeasy atmosphere. If you want a little bit of structure to your time in Wellington, download the Welly Walks app for a variety of self-guided walking tours. There are all different types of tours – from a Craft Beer Walk to a Foodie Trail to a 12 kilometer City to Sea Walkway. Each walk has an individual map marked with a route, and stops along the way each have descriptions of what you’ll find. Got More Time in Wellington? Oh, how we wanted to make it to the Pinnacles! These rock formations are stunning and were even a filming location for the Lord of the Rings. If you have some extra time in the Wellington area, make the 1 hour 45-minute drive from the city to the Putangirua Pinnacles Scenic Reserve and do some exploring! There seem to be some good campgrounds in the area, so spending the night is a good idea! While a bit outside of downtown Wellington, this design studio makes props, costumes, creatures and effects for movies. If you’re a movie buff, you can get a peek into a side of the filmmaking industry that few get to see. This studio is perhaps most famous for their creations for The Lord of the Rings Trilogy (Gollum, anyone?! ), but their portfolio includes a long list of blockbusters. You can visit the Weta Cave (gift shop and small museum) and watch a documentary free of charge, but if you want to really get behind the scenes and see the workshop, you’ll need to pay for a tour. Gonna be honest here, all the campsites in Wellington look pretty terrible. Get a bit out of the city for the best camping options. Evans Bay Marina Carpark: a small lot suitable for Freedom camping in Evans Bay. Camp Wellington and Costa Lodge: a small (6-site) private camping area on the Miramar Peninsula (about a 15-minute drive to downtown). Alternative: Head toward the Putangirua Pinnacles for a handful of nice campsites (check Rankers or CamperMate for details). And if you really want to stay in the city, we’d suggest getting a hotel. Luxury Hotel: Rydges Wellington - This 4-star hotel is steps away from the Bluebridge ferry terminal. The spacious rooms over look the wharf and they have an award-winning restaurants on-site. Mid-Range Hotel: Park Hotel Lambton Quay - This stylish hotel has modern rooms and a fitness room. It has a great location close to downtown. Planning a trip to Wellington? Save these on Pinterest!